Released this morning is a HOT and rare pop/soda coupon! Print it here >> $0.50/1 12pk cans of Dt Dr Pepper or click the picture above where it is pre clipped and ready to print! It is a rare coupon, so get it now before it disappears! Great for stores that double coupons!!!! At Work? That is no biggie, email the coupon to yourself and print it later!! What are you waiting for!!! This week's sales on Dr Pepper products are below, or print and wait for a better deal in the coming weeks! 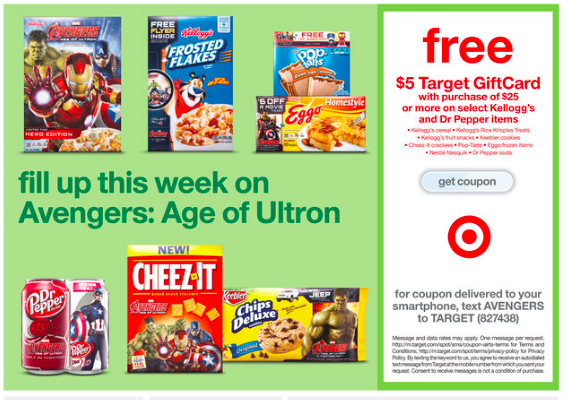 This week at Target there is also a free $5 gift card coupon when you buy $25 worth of Kellogg's and Dr Pepper Items! 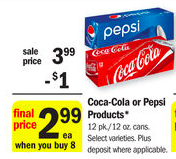 Check your local Meijer store's as Dt Dr Pepper products may be included in this sale, if so grab a 12pk for $2.50, wyb 8 participating items!